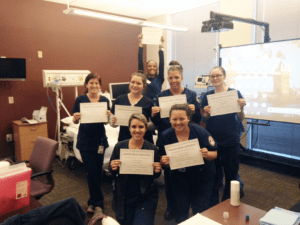 The Medical Assisting Program at the South College Asheville Campus is excited to announce that we are adding an IV Training Certification component to the curriculum. At our Asheville location, we offer both an Associate of Applied Science in Medical Assisting and a Certificate in Medical Assisting. Thanks to hands-on IV training, our graduates be even more prepared to enter the workforce as highly desirable and qualified health care workers. South College has partnered with Mountain Area Health Education Center (MAHEC) to offer this unique opportunity to Medical Assisting students at our Asheville Campus. The IV prep course provides students with practical Simulation Lab experiential training in the processes of initiation and removal of an IV catheter. Due to the ever-changing healthcare environment, the demand for the versatility found with CMA-AAMAs has increased exponentially. In addition, the medical community has expressed a need for additional training in basic IV skills, making medical assistants with those skills much more competitive in the job market. With this new training, South College graduates will be in a position to initiate and remove IVs under the supervision and at the direction of a physician in the state of North Carolina. The South College Asheville Campus Medical Assisting Program strives for student success by providing quality education through varied, up-to-date clinical training opportunities for each student, as well as comprehensive on-ground teaching that delivers a strong foundation of knowledge. As part of our ongoing effort to meet the growing skill demand of the healthcare community, this innovative partnership with MAHEC truly sets South College apart in our ability to offer training above and beyond traditional Medical Assisting programs. South College’s Asheville Campus offers a CAAHEP-accredited medical assisting program that qualifies graduates to take the AAMA certification exam. If completed successfully, this exam results in the CMA-AAMA credential. Only students who graduate from a CAAHEP or ABHES accredited program are qualified to take the CMA-AAMA or RMA-AMT (American Medical Technologists) credentialing exam. South College is the only Medical Assisting Certificate program in northwest North Carolina college that is accredited by CAAHEP and students can sit for the CMA/AAMA Exam. South College offers Certificate in Medical Assisting and Associate of Applied Science in Medical Assisting programs at our Asheville Campus. If you’d like to learn more about these programs, just get in touch or schedule a visit!